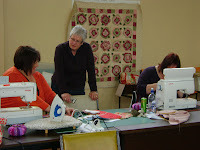 I have just spent the weekend down in Southland with the girls from Kitz 'N' Thingz. 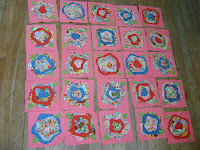 I was tutoring the French Roses raw edge quilt, which we did in flannel. This is Angela's version of the quilt. Some girls travelled down from Dunedin and we also had Helen come over from Stewart Island. Along with the ladies from Invercargill, there was plenty of laughs to be had. 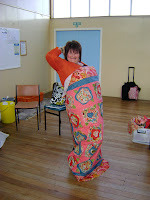 And Angela is well pleased with her quilt don't you think. Great venue at Edendale, with plenty of room to lay out the blocks on the floor. 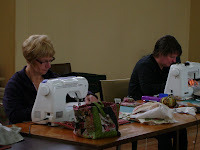 Those sewing machines whipped up a storm all weekend. The company was awesome and the food was great!! Thanks to Angela, Jo, Lorraine and Janet and hope to do it all again next year. Now it is time to concentrate on the trip to Houston. 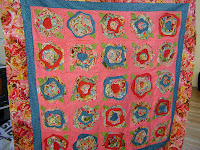 looks like you all had so much fun, French Rose looks great, can't wait to start mine - fabric all packed tho!